“What exactly is Hootsuite?” That is a question I have been fielding lately, particularly from new coaching clients. Here is an introductory look at the social media tool. Hootsuite is a tool that simplifies a user’s social media experience by allowing virtually all duties across a multitude of platforms to be enacted within one easy to use dashboard. When a person signs up for the service he/she configures that dashboard by securely adding user names and passwords for any or all of the following platforms he/she uses: Twitter, Facebook, LinkedIn, Google Plus, FourSquare, YouTube, Instagram and Tumblr. A WordPress blog site can also be added. After configuration, one user name and password allows the client access to all his/her social media accounts, eliminating the need for continuously signing in and out of them individually. 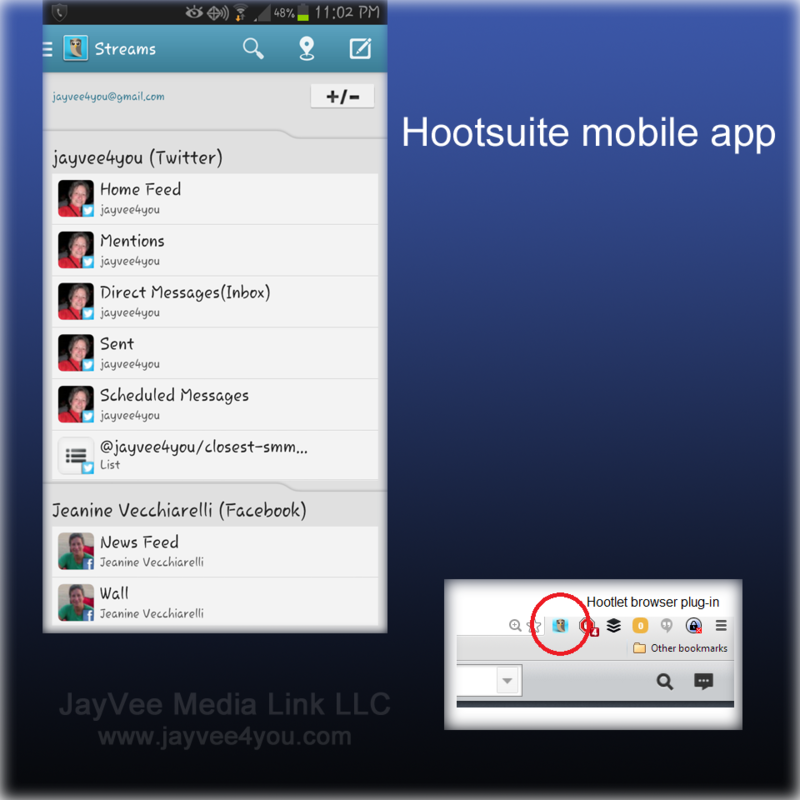 Hootsuite allows users to monitor activity on their social media platforms, and to post to them. Posts may be shared immediately, or they can be scheduled for release at a future time and/or date. They can be easily edited and even deleted from the scheduled streams. Another great feature of Hootsuite is its built in URL shortening service. When sharing links to Twitter we can’t afford to have our 140 character maximum be taken up by long URLs. Furthermore, they are unsightly even on platforms that allow unlimited characters for posting. We need only paste our long form links into Hootsuite’s status box, click “Shrink,” and a much more manageable version is generated and inserted into our posts. As an added bonus, Hootsuite tracks the short links it creates. This puts the analytics for what we share right at our fingertips. Two features that help keep Hootsuite close by for easy use are its mobile app for our smart phones, and its Hootlet plug-in for our desktop/laptop browsers. Both are straightforward, fully functional and very easy to use. Hootsuite offers three levels of service. Its basic level is free for use by one client, who can add up to five social media accounts. Its Pro level allows the integration of up to 50 social media platforms, and one “team member” to assist in management duties. The entry Pro level costs $8.99/month, but add-ons are available if a user needs to handle more for expansion of his/her social media business presence. The final level is Enterprise, which is for big businesses with large staffs and much to oversee. As users grow their social media presences they may find useful the more advanced features Hootsuite offers. They may, for example, wish to configure platform streams to allow for monitoring of specific groups or keywords, including mentions of their companies. Undoubtedly they will also want to take advantage of the tool’s integrated analytics for research and reporting. 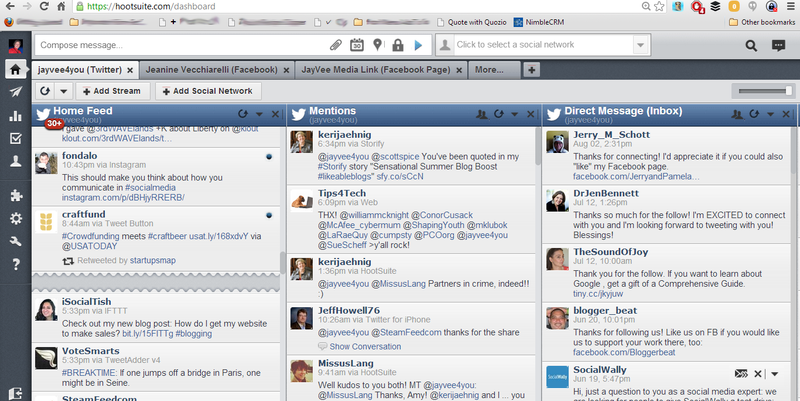 Have you tried Hootsuite yet? What is your impression? Please leave your thoughts in the comments section below! This entry was posted in automation, business online, business planning, Facebook, Google Plus, Hootlet, Hootsuite, Instagram, LinkedIn, media management, media platforms, mobile devices, online marketing, Social Media Management/Marketing, Twitter, Wordpress, You Tube and tagged automation, business online, Facebook, Google Plus, Instagram, Jeanine, LinkedIn, media platforms, smart phone, Social Media Management/Marketing, social media tools, Twitter, Vecchiarelli, You Tube by Jeanine Vecchiarelli. Bookmark the permalink.